Since receiving a Let’s Make it Possible grant from Palladium, Springfields has been working to enhance factory workers’ rights through a mobile grievance system. Palladium’s Alexandra Britton and David Shirley reflect on the results Springfields has achieved, one year on. Springfields was one of two initial Let’s Make it Possible winners. Photo credit: http://ow.ly/5SVr30azFRW. Monitoring supply chains and ensuring sustainability can be challenging, especially in factory settings where workers’ rights aren’t always fully protected. Recogniszing this, Springfields—a social enterprise specialising in ICT4D in the Global South—successfully built and launched a SMS grievance system for workers in over 60 factories across Indonesia, Cambodia, and Vietnam. Through this app, workers can anonymously send a text message to factory HR or compliance staff and raise concerns if they feel their rights are being compromised. While the system was well-received and able to build a user-base of over 450,000 individuals, it remained limited in its reach and offerings. Encouraged by positive feedback from the SMS product, Springfields sought to develop a universally adaptable Android grievance application that could connect workers directly to the brands buying goods from the factories. In July of 2015, Springfields submitted a concept note for Palladium’s Let’s Make It Possible Challenge, which aimed to fund and support projects testing or demonstrating innovation in development work. Recognising their potential to solve a pressing global workforce issue, Palladium shortlisted Springfields and invited them to participate in a crowdfunding competition. As one of two winners, Springfields received $25,000 from Palladium in addition to the funds raised through Palladium’s platform. It was through this Challenge Fund that Palladium was ultimately able to help Springfields expand their services to reach new markets and sectors. Product innovation is often risky, and requires investment. For a company that was already spending over 20% of its revenue in R&D, Springfields did not have the surplus capital to put into developing this new Android product, a potential game-changer for the industry. Palladium’s challenge funding reduced some of this risk, and provided Springfields with an opportunity to create the system they envisioned and introduce it to new markets using remote installation. During the app development process, Springfields realized there was the potential for unwanted market cannibalization, and introducing this new, innovative product could inadvertently take away market share from its SMS system. To overcome this, developers added a unified online dashboard to the Android system, which enabled brands to better oversee all the factories in their supply chain. Essentially, this enabled the SMS and Android systems to complement each other, facilitating unified data collection into a central location. Clients would be able to utilise the Android system in areas where smartphone and Internet data connectivity penetration is high without losing users in remote locations still reliant on text messaging. Using the Let’s Make It Possible grant, Springfields developed the Android system with a team of programmers and prepared for the first round of testing in January 2016. 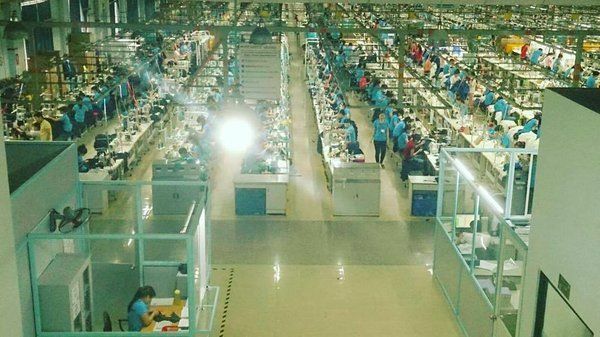 By May, the Android system was deployed in PT Victory Ching Luh Indonesia—a Nike supplier footwear factory based in Banten province who were already using the SMS system. With 14 factories across Indonesia, China, Taiwan, and Vietnam, Ching Luh Group has established itself as an industry leader, partially by utilising creative methods to maximise employee well-being and workforce development. As a result, Springfields has been able to sell the application to six garment factories with work forces ranging in number from 3,000 and 10,000, approximately 90% of which are women. Additionally, Springfields has been able to reach new sectors, and obtained commitments to use the application from three rural banks and the Papuan Chamber of Commerce (KAPP). KAPP’s 12,000 person member-base includes individuals who run SMEs across Papua and West Papua provinces in Indonesia. The introduction of this product will now enable these SME owners to access information and ask questions around KAPP’s business services and access to finance. Springfields hit revenues of $40,000 USD in the final three months of 2016, which their founder attributes, in large part, to the application improvements made possible by Palladium’s Challenge Grant. Over the next year, Springfields will focus on marketing the Android system to new clients, with an aim to match or increase their SMS system’s user base. At the moment, they are looking at expanding to sectors beyond their original scope—agricultural supply chains, healthcare, local government transparency initiatives, and other manufacturing industries—once again revealing their ability to think outside the box and positively disrupt the market. Springfields’ experience illustrates the importance of partnering with other innovative companies to provide fresh, creative ideas to solve traditional business and development challenges. Palladium is committed to fostering innovation and implementing solutions that generate lasting social and financial benefits in multi-actor systems. Collaborations with young, dynamic organisations like Springfields lead to the cross-pollination of ideas such as applying technology to address workforce development challenges, ultimately facilitating the intention creation of enduring economic and social value. If you are interested in learning more about Springfields and their products, please visit their website.